Deluxe professional face painting kits for parties and regular face and body painting. Nancy says, 'This kit is ideal as a first purchase and you can slowly build on your collection wi.. Put together by us and exclusive to Face Painting Ireland. Ideal for parties and events and for p..
A large 36 piece stunning box of goodies for a budding artist. Contents: 2 x .. 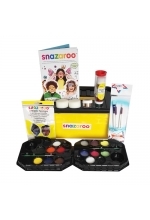 This super cute Gift set is perfect for any budding young face painter! You can create up to 60 f..